H. G. Ridder Automatisierungs GmbH is based in Hamm, Germany and has over 30 year’s experience. The company has established an international customer base supplying water jet cutting machines to a variety of industries from subcontract businesses to tier one Aerospace and Automotive manufacturers. 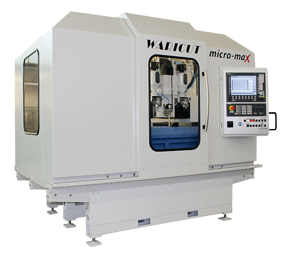 The Micro-Max has a decisive advantage, as it can perform micro cutting, standard abrasive and pure water cutting without any technical changes. Due to continuing miniaturisation of components in medical technology, electronics, automotive and aerospace, a fine abrasive waterjet is used for precision. Today versatility plays a key role in machining of cutting jobs. New fields of application for waterjet cutting (abrasive or pure waterjet cutting) can be opened up by integration of 3D cutting head axis. Both types of cutting head axes (2D and 3D) can be combined in one machine to provide more flexibility. 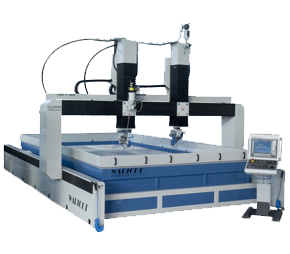 The optimal solution for large components typically used in aerospace, wind power plants and vehicle manufacture is the portal waterjet cutting system. To achieve maximum flexibility, each high portal system can be equipped with several 2D or 3D cutting heads with multiple bridges for simultaneous processing.